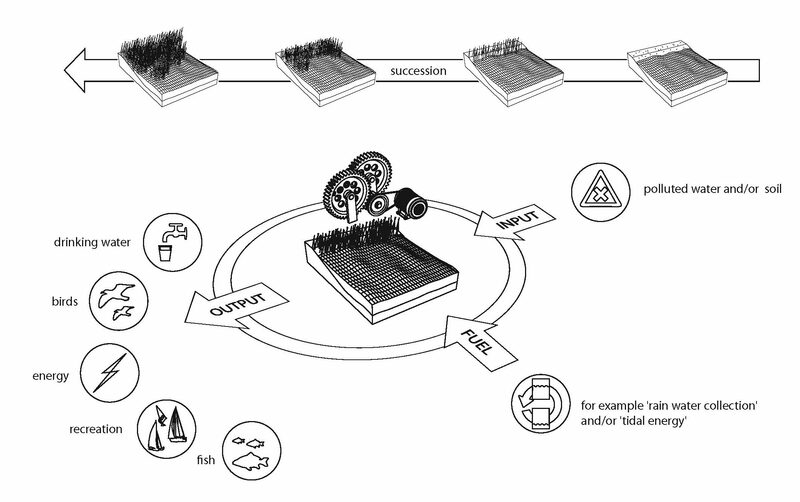 Recent examples of landscape machines envisioned in the design laboratory at Wageningen University have revealed several types that clarify the diversity of living system design. Even while all designs reveal a site-consciousness, they differ in their productive aim and living system methods. With the ‘production type’ an initially small enclosed cycle of crop or livestock breeding is upscaled to become an open chain of nutrients, waste and fertilizer exchange. The landscape machine enlarges the amount of production units while being responsive to existing or dormant landscape processes that are cooperatively used. With the ‘waste treatment type’ it is intended to decontaminate soil, water or artificial materials by means of ecological processes. The sequence of processes is determined by variation in time, size and position of the various cleaning stages. Eventually, the majority of waste is turned into valuable resources. In some cases, a minority of waste residue has to be isolated to perform in extreme types of landscape environments (e.g. the sink garden in Dredge Landscape Park) and to avoid contamination of other systems. The ‘system-repair type’ is an intervention in a landscape to re-adjust an unbalanced aspect within for instance delta regions, riverbeds or beach and breach coastlines. Due to human creations such as deep sea harbors, some dynamical systems need continuous and costly maintenance that results in an equally continuous hindrance of biodiversity and system complexity. Such landscapes are ‘kept alive’ by relentless human involvement that by their necessary brutality continuously effect the evocation of natural balances. Carefully designed landscape machines are however capable to catch up with natural balances within dynamical landscapes and by doing so, introduce more abundant and diverse biodiversity that can thereafter become the basis for local and sustainable economical management. For example, the project ‘Ems, full hybrid’ , reveals that a sea-delta can be restored to a natural balance of width, depth and shape of the delta while adding new breeding grounds for mussels and a vast diversity in marine biotopes that, given the change to mature, will re-establishes an (economically profitable) gradient between mainland and delta landscapes. Lastly, the ‘renewable-energy type’ of landscape machines are intended to redesign the infrastructure of energy and mass exchange within a confined physical environment (or region). The availability of local materials and energy to produce electricity and heath/cooling can be enhanced by living system design. Renewable energy provided by natural forces such as ebb and flood, plantgrowth, wind, sun, and the chemical difference between sweet and salt water (i.e. blue energy) all offer parts of a puzzle that is needed to assimilate and store a guaranteed amount of energy. The various parts of this machine operate within their own timeframe and speed, some very slow and some need prevention to develop into the next successive state. The periodicity and overlapping biorhythms are specific to this type of design and are especially interesting to describe by way of an evolutionary thermodynamical system.